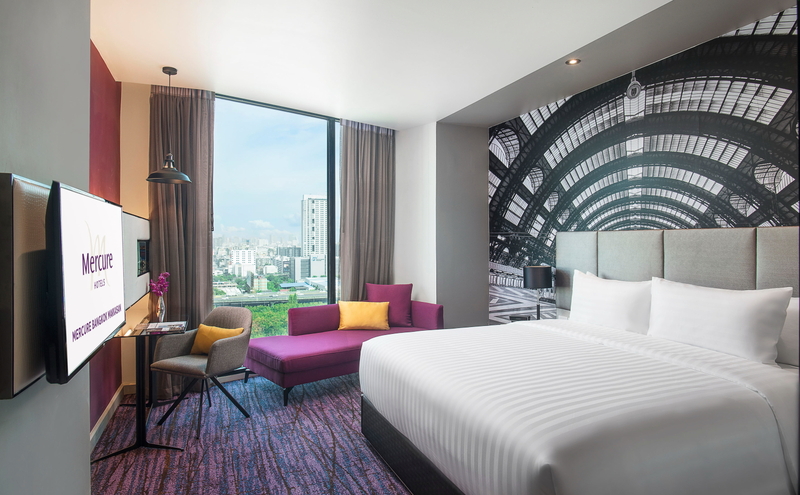 AccorHotels has expanded its already substantial portfolio of hotels in Thailand with the opening of the Mercure Bangkok Makkasan. Located in Bangkok’s city centre, the 180-room hotel has direct access to Bangkok Airport Link Makkasan station and Petchburi MRT station. The rooms and suites, designed with train travel inspired themes, are equipped with a Smart TV, an in-room safe, minibar and rain shower. The 25sqm Executive Rooms and 45sqm Executive Suites feature a separate living room with complementary minibar, espresso machine, iPod dock and BOSE Bluetooth speakers. The hotel also features an outdoor pool, fitness center, three floor to ceiling meeting rooms, an all-day-dining restaurant that features live cooking stations, a wine lounge and a pool bar. The hotel’s General Manager is Mourad Brahmi. See latest HD Video Interviews, Podcasts and other news regarding: AccorHotels, Makkasan, Bangkok.